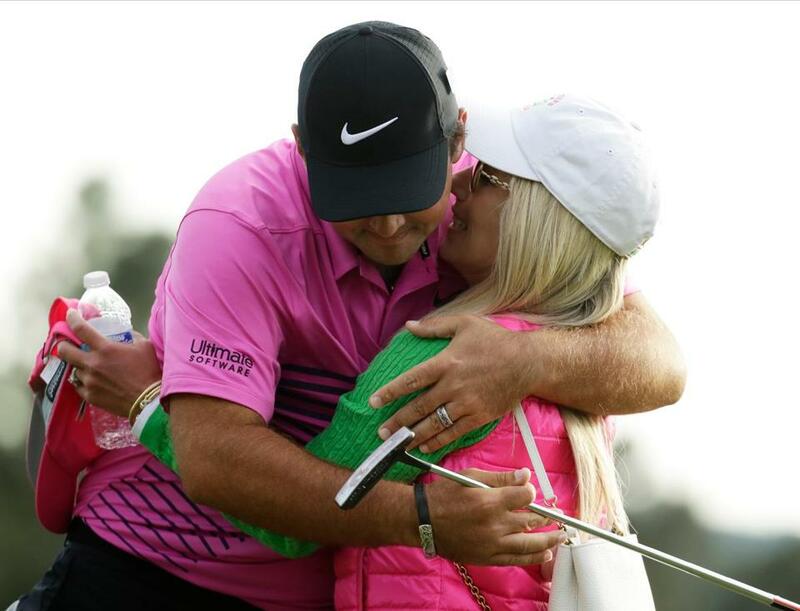 Patrick Reed celebrated with his wife Justine Karain Reed after he won The Masters golf tournament on Sunday. There are certain rites of spring I love. One of them is the Red Sox returning to the Fens like the swallows to Capistrano. Every once in a while, like this spring, there is the prospect of the Sox playing a meaningful, early series, like the one that begins Tuesday against the Yankees, while the Bruins and Celtics are poised for deep playoff runs. But, then, with Kyrie Irving out, that Celtics run might very well be much shorter than hoped. Another great spring tradition is The Masters, the iconic golf tournament at Augusta National in Georgia. It is, with the British Open — or what the Brits just call The Open — my favorite of the four major golf tournaments. I usually watch a lot of it, but family and work commitments combined to limit my viewing this year to just a chunk of the final day on Sunday. The drama centered on whether Patrick Reed could hold off charges by Rory McIlroy, Rickie Fowler, and, with a ridiculous closing 64, Jordan Spieth. As Reed stood over the final putt on the 18th hole, Jim Nantz, who anchors the CBS coverage, asked very dramatically and very rhetorically whether Reed’s life was about to change. Why is Patrick Reed estranged from his family? The estrangement dates back to 2012, when Reed had a falling out with his family when he decided to marry Justine Karian. “Yes it will,” Nantz intoned as the short putt settled in the hole and Patrick Reed raised his arms in triumph. “Captain America,” Nantz added, referring to Reed’s nickname for his steely, stunning play for his country in the Ryder Cup tournament against Europe. And, in one sense, Patrick Reed had indeed become an American icon. It was all very poignant. But it was all very staged and devoid of the most basic facets of reality, I later learned, when I got up early Monday morning, before the dawn, and read a haunting story by Alan Shipnuck in Golf magazine. It turns out CBS did not allow the real story to intrude on its version of the story, complete with a sappy, melodramatic soundtrack and misty-eyed nostalgia. Nostalgia, by the way, which completely glosses over a history of racial and social exclusion practiced by the great and the good who run that beautiful golf club in Georgia where the Masters is held every year. But, then, why spoil a ratings-driven narrative with something as inconvenient as the truth? And the truth is, Patrick Reed celebrated his Masters win with only half of his family because he is estranged from the other half, his parents and his sister. If CBS had even a passing interest in the truth, instead of just making money, then it would have been impossible to ignore the elephant who walked up the 18th fairway with Patrick Reed. The elephant that stood next to Reed as he lined up the putt that would, as Jim Nantz repeated ad nauseum, change his life forever. The elephant that followed Reed into the Butler Cabin where last year’s winner, Sergio Garcia, helped Reed put on the green jacket that symbolizes Reed’s membership in one of the most exclusive clubs in the world. That elephant is the fact that six years ago, Reed got married at 22 to an older woman who fully supported his decision to cut off any contact with his parents and his sibling. 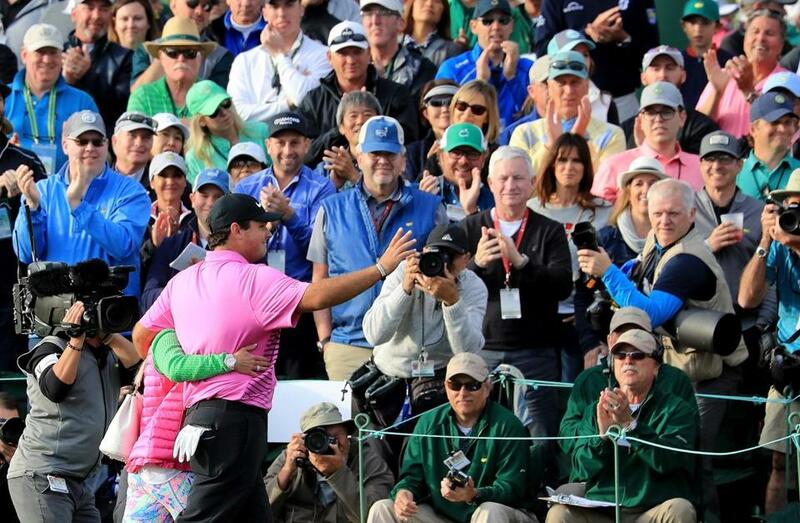 Patrick Reed hugged his wife, Justine Karain, after winning the Masters golf tournament Sunday. As Alan Shipnuck explained, the real story is that Patrick Reed is a complicated young man whose march to greatness has been accompanied by almost painful separation — from his college teammates, from his colleagues on the PGA tour, and, most poignantly, from his own flesh and blood. But when you’re hawking some Madison Avenue version of the American dream, something as messy and as complicated as real life is not for sale. Everything else is. Including integrity. The irony, of course, is that the real story is far more interesting, far more real, far more revealing of the human condition, than the packaged one. And Patrick Reed’s estrangement from his family, not his overhyped entry into the pantheon of mythic Masters winners, is the real story. But, again, what unfolds on CBS every April is not real. It’s entertainment, carefully and cynically packaged to make the network and its sponsors the most amount of money possible. Those who control the packaging have decided that family dysfunction doesn’t sell cars and expensive watches and the other overpriced stuff they hawk during the four days of the Masters tournament. The funny thing is that if the people in the control room trusted the truth as much as they trust the people who tell them what to do, they would realize the truth might actually boost their ratings. The fact is that, compared to identifying with multi-millionaires who can routinely drive a golf ball more than 300 yards, far more people sitting at home could relate to what the Reeds and his wife’s family are engaged in: the pitting of one family against another, the way money can act as fuel to any family fire, the animosities that breed in forced silences, the way grievances real and imagined can make people who once loved each other hate each other. After reading Alan Shipnuck’s stunning story, I turned on “CBS This Morning,’’ wondering how they’d cover it. I have appeared on the program and know and like and respect many of the people on that show, because they do good, serious, important journalism. But the script hadn’t changed overnight, even as Shipnuck’s story went viral. So the script was all breathless hype. The opening segment, “Your World in 90 Seconds,” showed Reed lining up the putt that sealed the championship. “Will this be his life-changing moment?” Jim Nantz asked rhetorically, as Reed stood over that final putt. I’m gonna go out on a limb here and suggest life for Captain America changed quite a bit in 2012 when he married a woman who, with her family, seems quite content to be part of the wall that has separated Reed from his parents and sister. Patrick and Justine Reed walked off the 18th green to cheers. When someone wins The Masters, there is an elaborate ceremony, rich in tradition, in which all these millionaires sit around in their gaudy green jackets, like a meeting of some secret society. Except it’s anything but secret. It’s broadcast to the world. Those green jackets are symbols of exclusivity, of being part of something millions of others covet but never will be lucky or talented enough to achieve. It’s all a bunch of jive, of course. Because at the end of the day, when Patrick Reed got home and hung up that green jacket in his closet, the fact remained that he had hugged a bunch of strangers on a day he chose not to hug his own mom, a day we’re all told was the greatest day of his life. 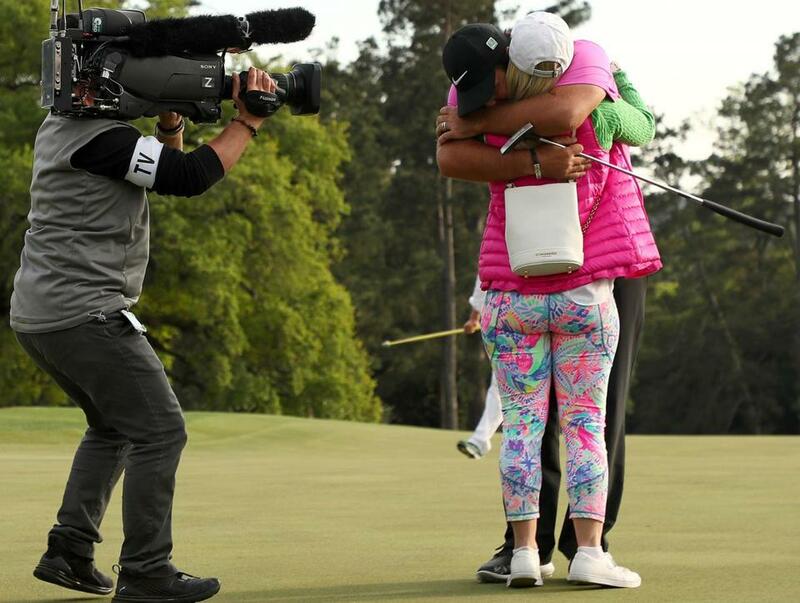 And if you can’t hug your mom after winning The Masters, what’s the point? Correction: An earlier version of this story misstated the name of Jordan Spieth.